Addressing the Public or Dressing the Facts? LM XII (Jan 1781): iii. Image © Adam Matthew Digital / British Library. Not to be reproduced without permission. We couldn’t let the first month of the year come and go without reflecting on one of the constants throughout Lady’s Magazine‘s long print run. Every January from the early 1770s right through 1818, where our project ends, the magazine opened with an Address to the Public. The column’s title sounds rather grander than the editorial leader familiar from today’s monthlies, although its function was largely identical: to thank readers for their patronage in buying the magazine; to divert them to content of which the editors were especially proud; and to persuade subscribers that their money had been well spent. The sheer quantity of puffing that takes place in the Addresses to the Public is more than enough to power any one of the many ‘aerostatic voyages’ (balloon flights to you and I) about which the Lady’s Magazine routinely raged. Indeed, to read the editors’ annual announcements you would be forgiven for thinking that the Lady’s Magazine was the first magazine ever to have catered for a female audience, or to have celebrated female writers, or that it was the only, and certainly the most popular, periodical to have solicited reader contributions. LM, XXXIV (Dec 1803). Image © Adam Matthew Digital / British Library. Not to be reproduced without permission. 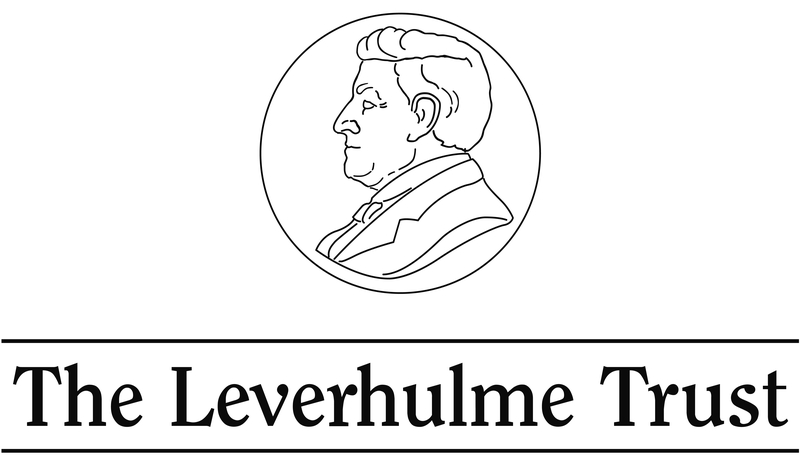 They also, in the absence of any known surviving publisher archive, offer up clues to such important and complexly related matters as: how many people read the magazine (in fact the only statistics we have to go on are those cited in the magazine itself); how the magazine was run; who wrote for it and why. Take just one of these questions by way of illustration. The identities of most of the magazine’s editors over the course of its nearly 70-year run remain obscure to this day. Editorial practice, however, becomes much clearer when the Annual Addresses are read, especially when they are read in conjunction with the monthly Correspondents columns. From these we see anecdotal evidence that what we might strongly suspect must, in fact, be the case: that a work so eclectic and yet, peculiarly, so coherent, had to be the work of multiple hands. We get glimpses of a succession of editorial boards, whose members were not always in agreement with one another, but the majority of whom believed in the magazine and had its best interests at heart. LM, XXXIII (Jan. 1802). mage © Adam Matthew Digital / British Library. Not to be reproduced without permission. Mostly, they testify to the powerful sense of community that the magazine held to be synonymous with its name. 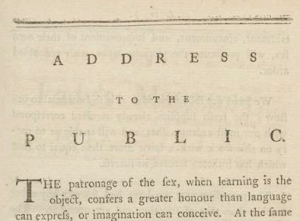 The Lady’s Magazine was, its editor or editors declared in 1781: ‘a Collection which is supplied entirely by Female Pens, and has no other end in view, than to cherish Female ingenuity and to conduce to Female improvement’ (LM, XII [Jan. 1781]: iv). 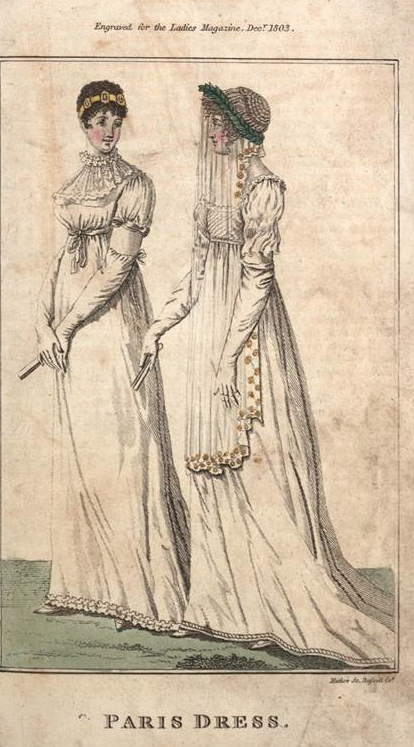 Any reader of the Lady’s Magazine in the eighteenth or nineteenth centuries or now would struggle to dispute the centrality of and importance given to women’s lives, writing or wit to the periodical and these factors were surely two of the title’s principal attractions to its readers and contributors. 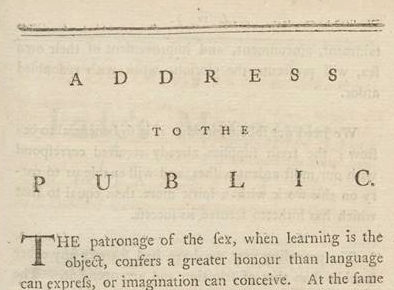 And yet almost every point made in this extract from the 1781 Address to the Public requires qualification. ‘Female improvement’ was undoubtedly a mainstay of the magazine, but the question of what constituted an improved woman and the best means to cultivate her talents were two of the most hotly debated topics throughout the magazine’s history. And if ‘Female ingenuity’ was cherished, as it certainly was by the magazine, then so too was that of men and boys, whose ‘Pens‘ provided a good deal of the content of the magazine’s pages, in fact rather more than we might feel comfortable with given its name. Our project, amongst many other things, is working away in the interstices between the magazine’s rhetoric and what is recoverable about its reality. In this fascinating, if sometimes frustrating ongoing work, our best and most misleading resource is the magazine itself. This entry was posted in Uncategorized on January 26, 2015 by ladys-magazine. The digitization of the Lady’s Magazine (1770-1832) has opened up exciting new research methodologies that we use on our project to help extrapolate trends and changes that occur in the periodical over the course of its 62 year print run. 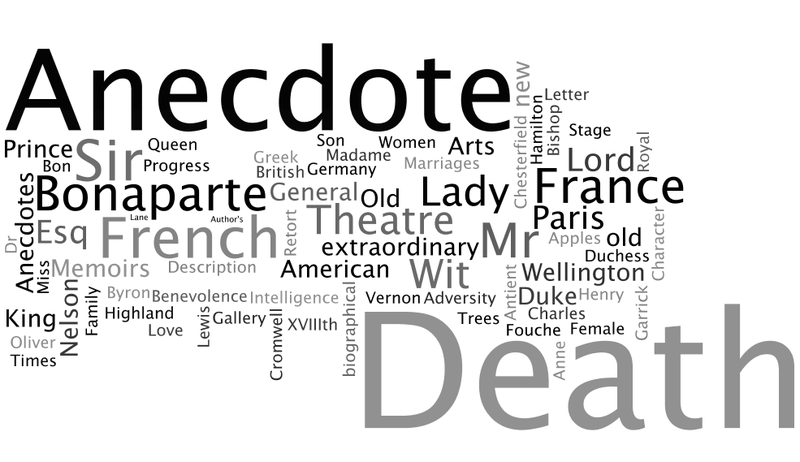 One of these research tools is the word cloud, a means of representing data visually by inserting a large quantity of text into a program that analyzes word frequency. The resulting word cloud depicts the range of word or phrase frequency through size difference so one can readily see how different terms are weighted relative to one another. This is useful when working with a database the size of the Lady’s Magazine because it enables us to see changes in, for example, the terminology used in titles over the magazine’s entire print run. 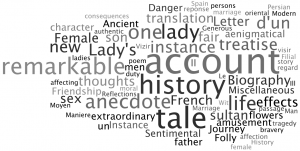 For example, in 1770 the most frequent 75 words that appear in the prose titles are terms descriptive of genres or types of writing: history, anecdote, treatise, account, biography, tale, letters, French, translation, etc. Also appearing frequently are the words ‘lady’, ‘lady’s’, and ‘female’. 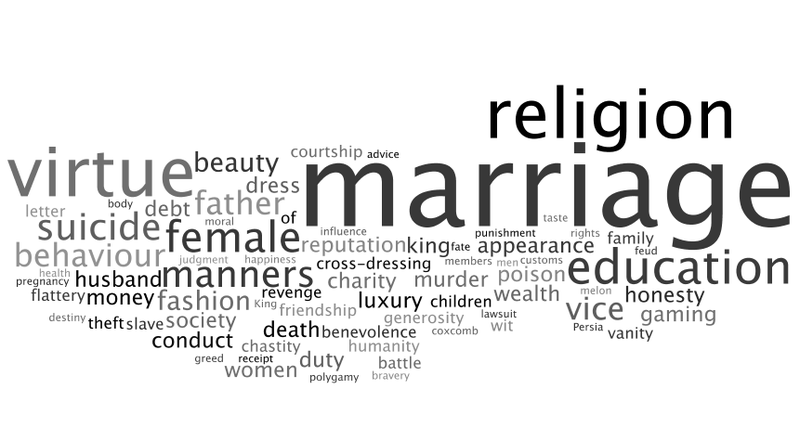 In comparison, using the most frequent terms in prose titles from 1815 reveals a shift in the magazine’s composition. With the exception of the ubiquitous anecdote, fewer genres appear while increasingly individual names and titles (with an understandable emphasis on the French) are featured. Prominently featured are the terms death, Bonaparte, France, Paris, Duke, Nelson, king, general, Lord, Hamilton, Chesterfield, Cromwell, Sir, Wellington and theatre. The content shifts that lie beneath the articles’ titles require, of course, careful analysis of the underlying contexts that such visualizations merely nod towards. 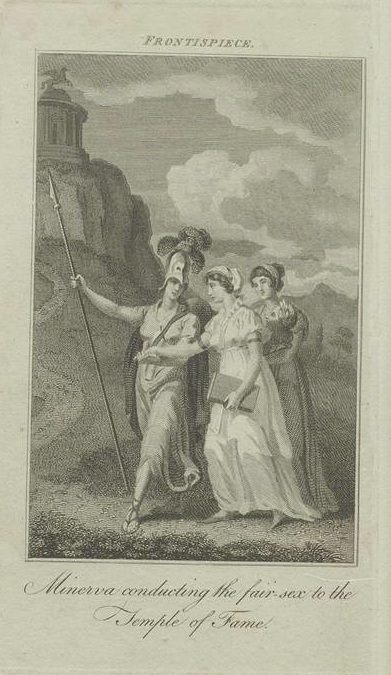 So while between 1770 and 1818 the term ‘men’ appears with around the same frequency, in 1778 the titles with men include ‘Verses on the Folly of Men’ while in 1817 readers were presented with ‘Maxims of Eminent Englishmen’. The same approximate frequency – but very different content indeed! 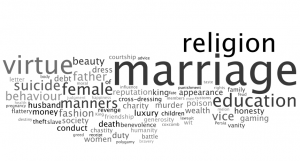 Because our index includes a series of keywords for each item in the magazine, we can compare word clouds of the keywords in one year to word clouds of the titles and discover substantial differences. 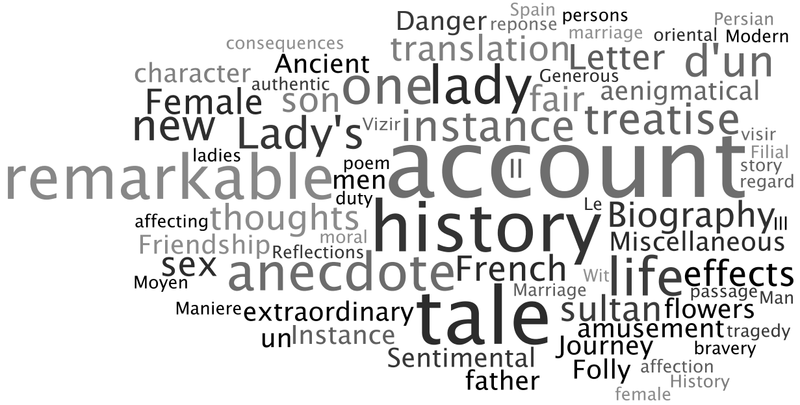 For example, the keywords for 1770 look quite different from the article titles. When working with material as sizeable in scope, quantity, and chronology as the Lady’s Magazine archive, similarly diverse research methodologies are likewise required. 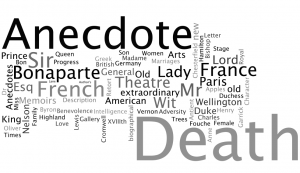 The word cloud is one of the methods that digitization has made possible and that raises new and important questions about the magazine’s content and how such content was presented to the readers. This entry was posted in Content and tagged archive, content, index, lady's magazine, magazine, methodologies, research, text cloud, word cloud on January 19, 2015 by jd359.